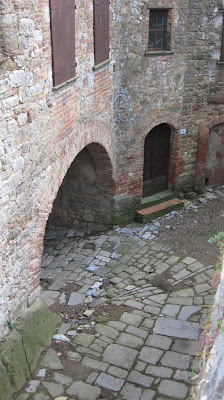 Back in Rome again, with some random pictures from my week in Cacciano. Here’s Davi, a new friend. Looking down on the old castle streets. Everything they say about the Tuscan light is true. 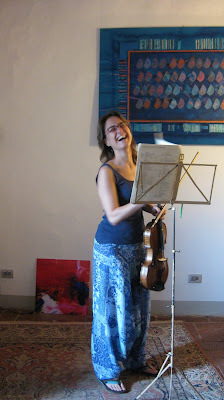 The lovely Rocio, about to play Brahms. Note the magic pants. Mimi and Janette working with Jocelyne on her Hindemith. 2) get back to LA and my own cello. 5) make the last revisions to the book. It’s so lucky that I had to move and deal with all of the summer distractions: my text would be less useful without the contributions from this session. 6) attend some USC football practices. Pete Carroll is the Mimi Zweig of football. Football is the technique of life. Last night, we performed at a winery just down the road. (keep an eye out for a Thirsty Cellist post) I played the slow movement of Chopin, a sonata I have avoided studiously, because its lines seem more cut out for piano. Working with Mimi on shifts has made the fingerboard feel smaller, and I have gained back a little of my identity as a player after being taught for just a week. Sono così felice per il mio amica. Non posso aspettare di tornare. Will be at LAX with bells on. "Football is the technique of life." OOOooo – I like this quote! Not sure at all what it means, but it sure does have a nice ring to it! You have a safe trip back home Emily! And I'm keeping my fingers crossed that an East Coast tour (to include Northern Virginia?) is in the making sometime in the next decade or so (haha! ).